Goliath is a news websites which has great spots for placing Ads and is also great for a review website. It’s built with a Twitter bootstrap meaning it uses a solid foundation. 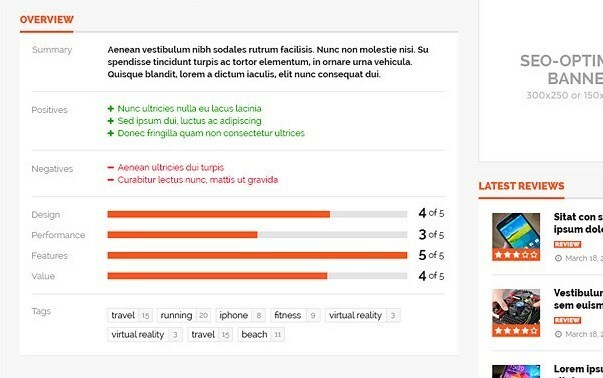 This is important because it means that it’s fully responsive (meaning it will be shown beautifully on a computer, a tablet or even a phone) and because it features standard elements. One of the first things you will notice is Planetshine mega menu. It’s a beautiful representation of your content. When you open it, you will see thumbnails of your posts, you can sort by categories for easier navigation. When you move on a thumbnail, it will fade to dark mode and excerpt will be shown. You can control the size of thumbnails and you can even disable them. It will show review ratings if you marked this post as a review. Second thing you will notice is a mosaic themed featured posts featured section where you can show your best / affiliated / commercial / review posts. When you hover over a post, background turns to a dark color in order for this posts to be focused. 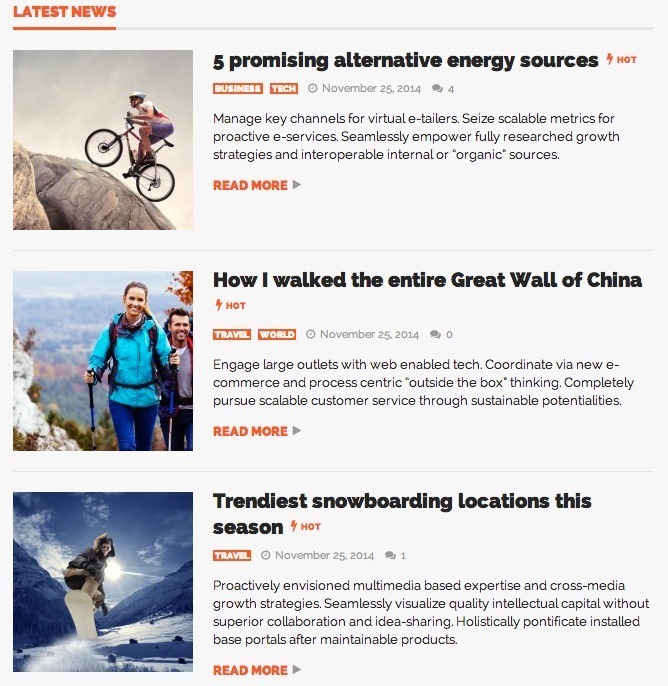 Below featured posts section, you can enabled another featured feature called simply featured news slider. Out of the box theme supports 5 colors, but you can customize them to your liking. Theme has for sake of usability 5 home layouts which you can use to quickly set up the theme. If you don’t want mosaic styled featured posts and featured news slider on your website, you can choose a more classical slider. Which can make wonders on some news sites. Goliath has a support for bbPress forum and WooCommerce meaning that you can run much more than a tech / news website. You can build community and even integrate a shop. 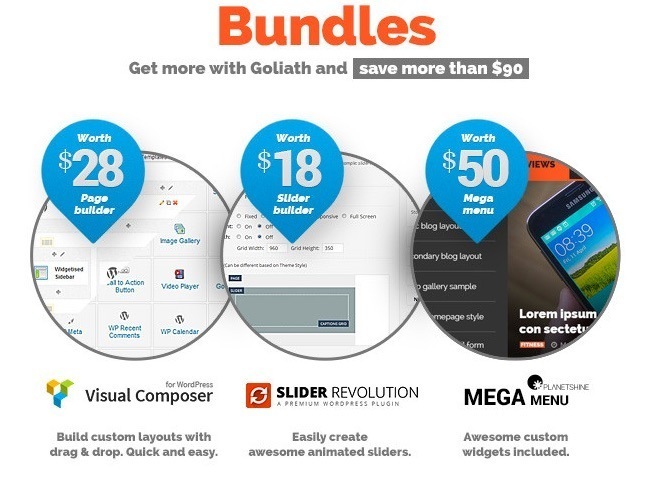 Theme bundles Visual Composer worth $28, Slider Revolution worth $18 and Planetside Mega menu worth $50. Goliath features several post elements. you can choose. First element is really great for news, it features one post with picture and 3 posts with smaller picture. You can add 4th post with smaller image and a gallery with small images. second post element is a classic, one bit picture with 3 posts with the smaller image below the main post. Usually used in combination with second same element in a pair but featuring another category. 3rd post element is featuring 3 posts with big image side by side. and it also features blog post element. Again a classic best used for the blog or list of last X posts. This are all just couple of post elements you can choose. 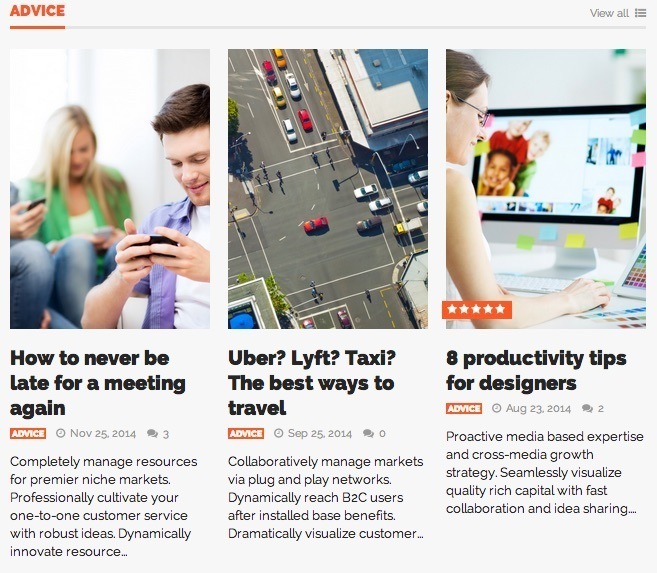 And since it is based on visual composer, you can build just and type of news /magazine /blog website you want. You can choose to show date, author and number of comments. But you can disable each element if you wish to do so. 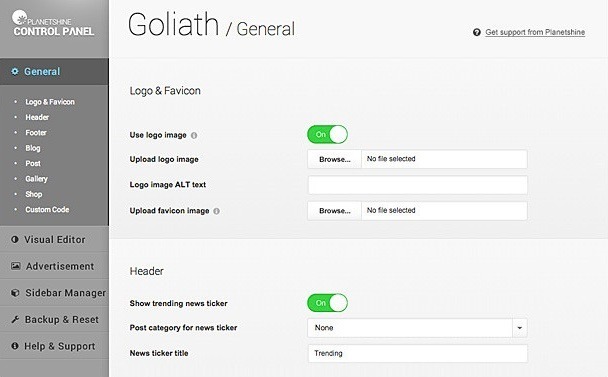 Goliath comes with a great theme framework. Planetside Control panel is feature rich where you can controll most of the settings like Ads, Sidebar, Logo, Header, Footer, Blog features, Post features, Gallery and Shop. Goliath has a review module integrated where you can rate products you review. Review module is rich snippets compatible meaning that you have great chance that your article will be clicked when shown on Google search page along side many similar articles. You can choose a boxed or wide layout. For background you can choose a solid color, background or a Particle Paralax background. 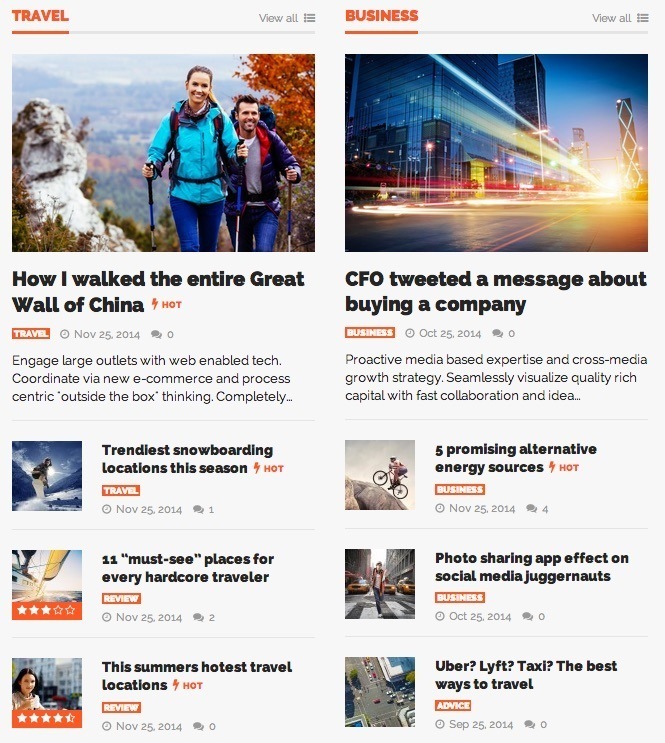 It would be unfair to say that Goliath is only a tech / news website. It can be a great fashion website. Combined with a webshop you have a winner. 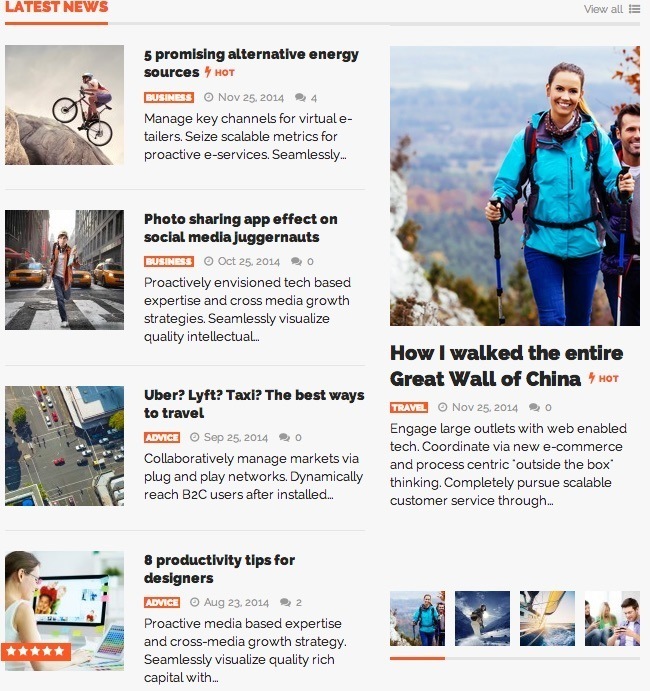 Goliath is a great theme for tech, news and fashion website. Since it supports bbPress and WooCommerce you can create a great community with a shop. Design is great and since it is based on Visual Composer you can design a perfect website. 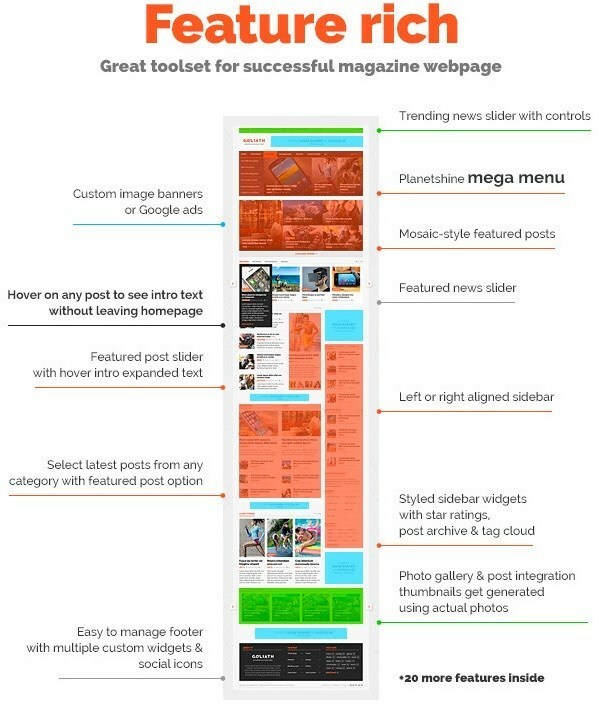 But don’t get me wrong, Goliath can be a great blog theme as well.